Jesus said in John 19:30. 'it is finished". He took all YOUR and MY sins upon Him. He endured the beatings. He endured the ridicule. He endured the Cross for 6 hours one Friday. He did it so that ALL that you need to do, is accept it. take it and change YOUR way to HIS way. so that you may have eternal life. a farmer places a scarecrow in his field of crops. it scares the birds away. in Christian circles there are often scarecrows - people who do not bear any resemblance to Jesus. people who scare others away from Christ. don't let them do that. you will not be able to use that as an excuse one day when the judgment takes place. look at Jesus. see HIM. 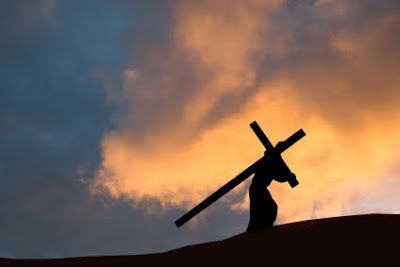 see Him carrying the Cross - with YOUR sins - on His back. see Him hanging on a cross and dying so that YOU may have eternal life. take the gift. see Jesus. don't look at the scarecrows in the field................... look at the Cross. only that.